Give your stamp dies a charge! Static cling cushion and plain film will attach to many “staticky” surfaces, such as our acrylic mounts. Gray Cling Cushion is 1/8” thick and supplied in rolls measuring 27” wide by your choice of length. Most popular. Includes a self-adhesive backing for your stamp dies. 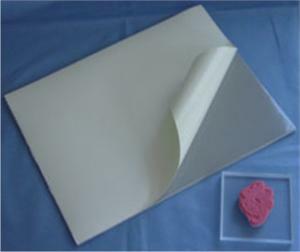 Plain Film is a thin plastic that can be attached to any material of your choice using your preferred tape or adhesive.